Call this method to format an LLSD to a stream. 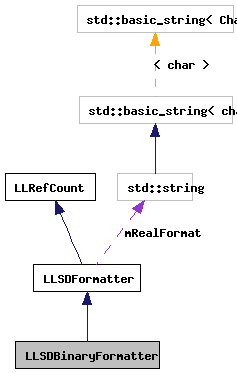 Helper method to serialize strings. 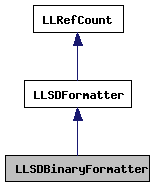 Formatter which outputs the LLSD as a binary notation format. The binary format is a compact and efficient representation of structured data useful for when transmitting over a small data pipe or when transmission frequency is very high. The normal boolalpha and real format commands are ignored. Definition at line 460 of file llsdserialize.h. Definition at line 1100 of file llsdserialize.cpp. Definition at line 1095 of file llsdserialize.cpp. data The data to write. ostr The destination stream for the data. Definition at line 1104 of file llsdserialize.cpp. References LLSD::asBinary(), LLSD::asBoolean(), LLSD::asInteger(), LLSD::asReal(), LLSD::asString(), LLSD::asUUID(), LLSD::beginArray(), LLSD::beginMap(), end, LLSD::endArray(), LLSD::endMap(), formatString(), ll_htond(), S32, LLSD::size(), LLSD::type(), LLSD::TypeArray, LLSD::TypeBinary, LLSD::TypeBoolean, LLSD::TypeDate, LLSD::TypeInteger, LLSD::TypeMap, LLSD::TypeReal, LLSD::TypeString, LLSD::TypeUndefined, LLSD::TypeURI, LLSD::TypeUUID, and UUID_BYTES. This method serializes a network byte order size and the raw string contents. string The string to write. Definition at line 1208 of file llsdserialize.cpp.